It’s been a day of differing fortunes for the antipodean currencies. The kiwi is the day’s biggest loser after a weak Q1 CPI report potentially put an imminent rate cut onto the table. In contrast, a bout of strong economic data out of China pushed the Aussie higher during today’s Asian session, though a much of that rally has since faded. The typically subdued pair has now seen a 400-pip trough-to-peak rally over the past three weeks, and the RSI indicator shows that rates are deeply overbought, setting the stage for a potential near-term dip. Looking ahead, the next fundamental catalyst will be tonight’s March Australian employment report, with economist expectations centered on 15k new jobs created and the unemployment rate ticking up to 5.0%. 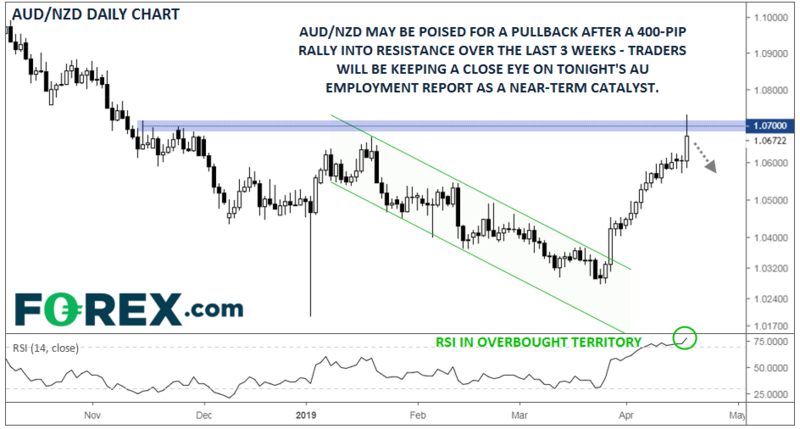 With the technical picture signaling a potentially stretched rally at resistance, a weaker-than-expected AU jobs report could be the catalyst for AUD/NZD to dip back below 1.0600 ahead of the weekend.